Planning your honeymoon or wedding anniversary? Or perhaps just looking to get away with that special someone? Costa Rica is an incredibly romantic destination and the perfect place for couples. Our custom vacation packages can include visits to the iconic Arenal Volcano, the eternally sunny Guanacaste, the culturally diverse Puerto Viejo and more. We can customize your trip any way you like! Maybe you want to visit one of the best spas in the world at the bottom of a volcano at the Arenal Nayara Spa & Gardens. Perhaps you want to spend your vacation zip lining, white water rafting and bungee jumping, or just relaxing by a gorgeous swimming pool. Either way, we’re here to help you have the ultimate honeymoon! How about spending your honeymoon in trouble-free paradise? We recommend the Northwestern corner of the nation to the coastalprovince Guanacaste. Here you’ll find an array of all-inclusive resorts available for your honeymoon, some of the best ones to be found on the Gulf of Papagayo. Vacationing at an all-inclusive resort means you don’t have to worry about anything. Our selection of all inclusive hotels have it all, incredible gourmet food, refreshing cocktails and world-class service. You can also take advantage of many different tours during your all-inclusive stay. Visiting volcanoes, national parks, zip lining, horseback riding, deep sea fishing, surfing and more areusually available and easily-accessible from all-inclusive resorts. Experience the adventurous and luxurious on your unforgettable honeymoon. Costa Rica is one of the most biodiverse countries in the world. Despite being such a small country, Costa Rica is actually made up of several different ecological zone. This means that the weather varies depending on what part of the country you are in. Costa Rica has a dry and wet season, with a longer dry season in the north west corner than the rest of the country. Roughly, there should be many more sunny days during the second half of November through May in Costa Rica’s Central Valley and Pacific side. This same area should be avoided during the second half of September through October and the beginning of November. The Caribbean, however, is an ideal place to visit during September and October and should be avoided when it rains the most, usually from November to February. Elevated places like Monteverde usually experience strong winds from December through February and the temperature can be a bit cold for some surprised visitors who were expecting hot weather in the tropics. Once you have the weather in Costa Rica figured out, it’s time to identify what kind of vacation you want! Do you a nature-inspired honeymoon? Or, would you rather spend every day relaxing on the beach? Perhaps you are a couple of adrenaline junkies and you want to take advantage of the many canopy and rafting tours? Lucky for you, in Costa Rica you can do it all! The perfect Costa Rica Honeymoon Package can be personalized for you. La Fortuna and Osa Peninsula are two great examples of destinations that combine romance with adventure. There are many magical and exotic locations in Costa Rica that inspire romance and love. One of these places is La Fortuna in northern Costa Rica. The area around La Fortuna is surrounded by natural hot springs and the beautiful Arenal Volcano National Park. If this wasn’t enough, the backdrop to this whole area is the grand Arenal Volcano and lush rainforest-covered mountains. There are several romantic hotels and resorts in Costa Rica but in La Fortuna one of their hotels really stands out from the rest. That would be Nayara Hotel Spa & Gardens. Travel + Leisure magazine considered this hotel to be the number one resort in Central and South America and sixth overall in the world. Outdoor adventures in La Fortuna are very popular. To mention a few, there’s excellent canyoning (rappelling) tours, zip lines, an extreme crater lake hike, a short but tough step trail to the incredible La Fortuna Waterfall, stand up paddling in Arenal Lake and mountain biking around it, up to 4+ white water rafting, caves and much much more. Osa Peninsula can brag about its biodiversity. There’s no place on Earth so naturally intense like Osa. With beautiful beaches adorned by tall primary lowland rainforests, this place is wonderfully romantic. This remote Southern Pacific corner of Costa Rica has many sustainable romantic venues, like another award-winning jungle lodge known as Lapa Rios. Embedded in the jungle on elevated terrain that overlooks where the Pacific unites with the gulf, Lapa Rios is a wonderful option for your all inclusive honeymoon vacation in Costa Rica. Rooms have incredible views and their service is authentically top notch. The place is perfect for couples searching for solitude, wildlife, beaches and paradise. Honeymoons in Costa Rica. We’ve compiled a list of some of the 10 best honeymoon activities in Costa Rica. A romantic dinner for two. Enjoy togetherness in a unique environment, either surrounded by a tropical jungle or with stunning ocean views. On the Pacific Coast of Costa Rica, you can see gorgeous sunsets. Is there anything more romantic then watching this magical moment together while enjoying a tropical cocktail? Costa Rica is not only a beautiful beach destination but offers a variety of landscapes. 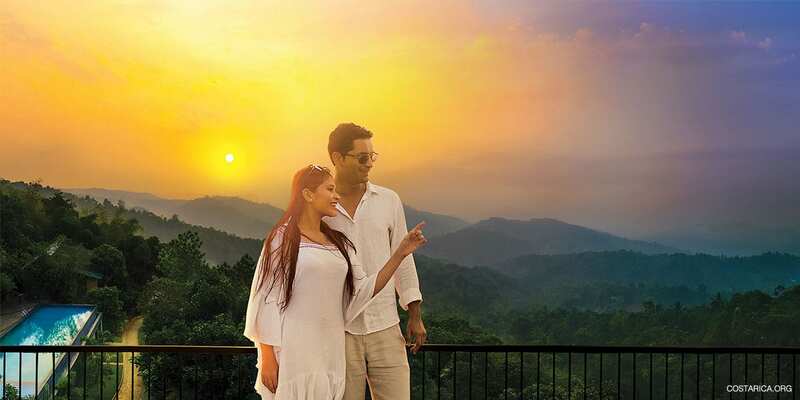 Don’t miss on your honeymoon to visit one of the many tropical jungles or rainforests. For a unique experience stay some nights in a hotel surrounded by lush vegetation and wake up to the sound of the singing birds. Costa Rica’s coast offers many great surf spots; so how about a surf lesson together? You will have an unforgettable time and a lot of fun in the waves. You should visit one of Costa Rica’s beautiful volcanoes; some of them are active. The natural hot springs are a perfect place to spend some time together while relaxing in the luxurious hot waters. Explore one of the many breathtaking waterfalls of Costa Rica on horseback. Try a couple’s massage at a Spa service. Go dolphin and whale watching! Or take a sunset catamaran cruise! Make a trip through a National Park and spot some wildlife you have never seen before. A great experience for nature lovers is to take part in a mangrove kayaking tour. Here you come close to an amazing and unique ecosystem. Costa Rica has so much to offer and the list doesn’t end here. These are some of the best activities for Honeymoons in Costa Rica, all for you to enjoy along with that special someone! Contact us and get the most out of your Costa Rica Vacation!